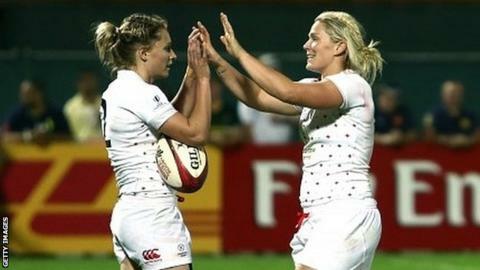 England won the Plate final to pick up vital qualification points towards Rio 2016 in the opening World Rugby Women's Sevens Series leg in Dubai. The top four sides after the series finale next May qualify for the 2016 Olympics and England, leading the bid for the home nations, are now fifth. They lost 7-5 to France in the Cup quarter-finals but rallied to beat Russia and then Fiji to win the Plate. England will face New Zealand in the men's quarter-finals on Saturday. England - also chosen as the home nation's representatives in the Rio 2016 qualification process - are looking to build on their third-place finish in the opening round of their series in Australia. They got off to a strong start with wins over the USA and Kenya, before losing 12-5 to Australia in the final pool game. It left England to face the All Blacks in the last eight, while Australia take on Scotland and Wales face reigning champions Fiji.